In the three-year cycle of Gospels read at Mass, Year B is Mark, the shortest of the four gospels. After reading the introductions in the dozen commentaries at hand with all their differences, I did not feel like writing even a ‘brief ‘one. Yet some background is useful for those who come to the book fresh, or have forgotten details from the last Year B. What Mark seems to call for is – just read Mark. The whole Gospel can be gone through in one sitting, and that is something I recommend doing sometime during this liturgical year. Get your sense of what Mark set out to do, what picture he paints of Jesus. 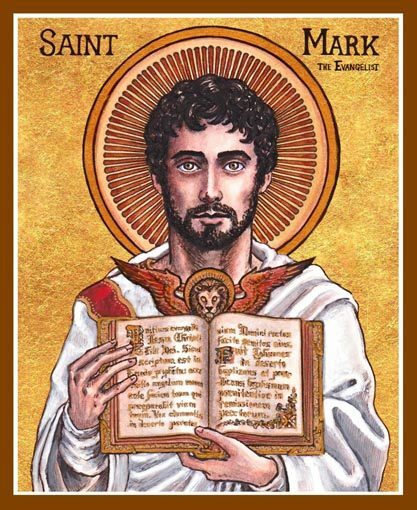 Modern scholars do agree that Mark was the first Gospel written, although it comes second in the New Testament order. The date is estimated as around 60-70 AD; and with many warnings about persecutions, it fits well into the period of Nero and the martyrdom of Christians. The author must be someone named Mark, although the gospels all come to us with no named author – the titles are later. Since ‘Marcus’ was one of the most common names in the Roman Empire, this is not much of an identification! Some look for other Marks in the New Testament, and often settle on the John Mark in Acts; also the Letter of Peter names one Mark as ‘my son’. Mark makes no claim to have known Jesus in his ministry, and is generally agreed to have used the oral traditions common in the early church. Mark may have invented ‘gospel’ as a way of writing about Christ – the word means ‘good news’ and was first applied by Jesus himself to his message. Like all the New Testament, it is written in the simplified Greek (‘koine’) that was the common language of the Roman Empire. Mark writes in a rough version of this with many expressions called ‘Semitic’ indicating that Greek was not the first language of the writer. (The various but related Semitic languages had been spoken in the Middle East areas, and they include the Hebrew of the Bible, and Aramaic which had taken over as the everyday language of Palestine.) Mark’s less-than-smooth style is covered up by most translations, which want to sound like good, even elegant, English. This obscures some points that are useful for study, and I will note these when they occur in the liturgy. Although the style does not seem sophisticated, the theology is profound. As James M. Robinson puts it, Mark is ‘theologically understood history’. Edward Schweizer, describes the way it is constructed as both ‘horizontal’ – going back to show the fulfilment of the Old Testament, and ‘vertical’ which is ‘the in-breaking of God’s heavenly realm on earth.’ This is seen right away in the first verses of the Gospel. It often seems Mark is more like a story teller than writer, with the constant use of the connecting word ‘and’ and much in the present tense like people still do in conversation. He uses over 40 times a Greek word which is translated as ‘immediately, ‘right away’, straightaway’. But also there are a number of techniques that show a thoughtful author. There are some literary effects of that time which are not common in ours, like the end echoing the opening and thus marking the closing off a section. He also makes a lot of what can be called ‘sandwiches’ by breaking an account in half and putting another story in the centre. When this happens, notice what light the middle story casts about the outer layer – or vice versa. Mark, unlike the other gospels, sometimes gives us the words of Jesus in Aramaic which brings us close to the original situation and thus to Jesus himself. Mark occasionally quotes the Jewish scriptures, but much else of what he writes has this as a background. Some of these are subtle and easily missed until pointed out. Mark has far fewer parables than Matthew and Luke, though he often speaks of Jesus teaching. He shows Jesus almost constantly in action, and always in relationship to those who listen and respond, and also those who refuse his call and eventually plot his death. Mark, more than the other evangelists, pictures Jesus in his full humanity, with a wide range of emotions, including being angry, tired, and not knowing everything. Yet from the opening words ‘Son of God’ as a title, he comes to the climax at Jesus’ trial before the high priest when claims to be the Messiah (or Christ) and son of the Blessed One’ – one of the strongest claims in the gospels. Mark does not try to explain everything and often leaves us to draw our own conclusions. At times he has an unanswered question, for example 4:41: ‘What kind of man is this that the wind and sea obey him?’ That technique leaves the reader to think it through. Mark also depicts the humanity of the disciples and apostles, showing them struggling to understand but misunderstanding, too sleepy to stay awake and watch with Jesus, fleeing when he is arrested. But he also notes their immediate commitment when Jesus calls them to follow. Mark stresses how Jesus taught them a new kind of leadership of service and how he predicted they would have to suffer as he himself would. So there is a sombre note to much of the teaching in this Gospel, though it is based on promises of ultimate joy. Mark’s gospel ends abruptly at the empty tomb, seemingly unfinished. (Our Bibles include an ending written by another writer, summarizing the appearances of the risen Jesus.) At issue is the question: is that where Mark intended to end, or was something lost, or was an intent to show the appearances of Jesus in Galilee not written down? The early church supplied three endings that appear in various manuscripts, so they seemed to expect more. The modern tendency is to think that is where Mark intended to end, and to reflect on that that tells us about the writer and the Gospel. Although Mark can be rapidly read – it is an almost breathless story seeming to rush from one moment to the next – I am finding that Mark has points which seem to call for a pause to think about what is happening or being said, and reflect on what this means. When a question is left hanging with no written answer, is one sign of a place to pause and look for our own answer. In these notes and discussions, I will bring in some of the background or reflection from studies as I have at home which are pertinent to each gospel selection. If you want to do more study on the gospel, there is a wide range of guides available, from short ones for beginners to long scholarly commentaries. Many can be found in bookstores and on the internet: some book sites allow you to ‘Look inside’ which can indicate whether that commentary suits you. One I would highly recommend is a short one which focuses on the deep meaning of Mark: Rowan Williams, Meeting God in Mark. It also has a good summary of what kind of person ‘Mark’ was, and what the Roman Empire was like at the time. It includes a reading guide to fit a Lenten project. Another short one calls on the reader to take the Gospel as something fresh and challenging: Nicholas King, SJ, The Strangest Gospel. With or without other sources, read Mark for what it tells you about ‘The good news of Jesus Christ, the Son of God’.